Caroline Geys is a Belgian-born (fluent in Flemish/Vlaams) visual artist living and working in Los Angeles. Her work focuses on exploring the various individual forms that make up a city in a macro and micro dynamic: architecture, topography, cultural and physical infrastructure, dynamic human activity and organic nature. Every line, dot, and color illustrates a connection made among these elements as the meld and recreates each other within this found composition. Since her first exhibit in Gainesville, Caroline has had numerous well-received exhibitions of her paintings in New York, South Florida, and Raleigh, North Carolina. She works in a wide-range of mediums; paintings, drawings, graphic design, sculpture, installations, and custom apparel. In May 2011 she moved to Los Angeles, California. Her new work is directly inspired by topography. Question: What’s behind the name of your current exhibit “Grow Till Tall Olifant” at Ann 330? Caroline: Grow Till Tall is the name of one of my large pieces (60 x 72 inches) inspired by a song “Grow Till Tall” by Jonsi. (The main guy from Sigur Ros who has his own solo project .) I saw him at Coachella 2010 and he played a sunset show and when he played “Grow Till Tall” I was blown away. It was one of those amazing shows that you’ll never forget. I was looking online for the song performed in other locations because I wanted to see if he changed the song when he played it live. There was one that I found at the Vic in Chicago, with a visual show incorporated, whereas at Coachella, the visual was the sunset in the background. At The Vic, the visuals consisted of slow rain and as the song progressed so did the visuals till the very end when it became a crazy thunderstorm. There is a part in my painting Grow Till Tall in the upper right hand corner that reminds me of that thunderstorm. So that’s where the part of the show’s title, Grow Till Tall comes from. Then Olifant which means elephant in Dutch (8 x 10 inches) comes from the small piece that exhibited at Art Basel Miami Beach in the Miami’s Independent Thinkers Exhibit last year, and it unconsciously turned into an abstract shape of an elephant. 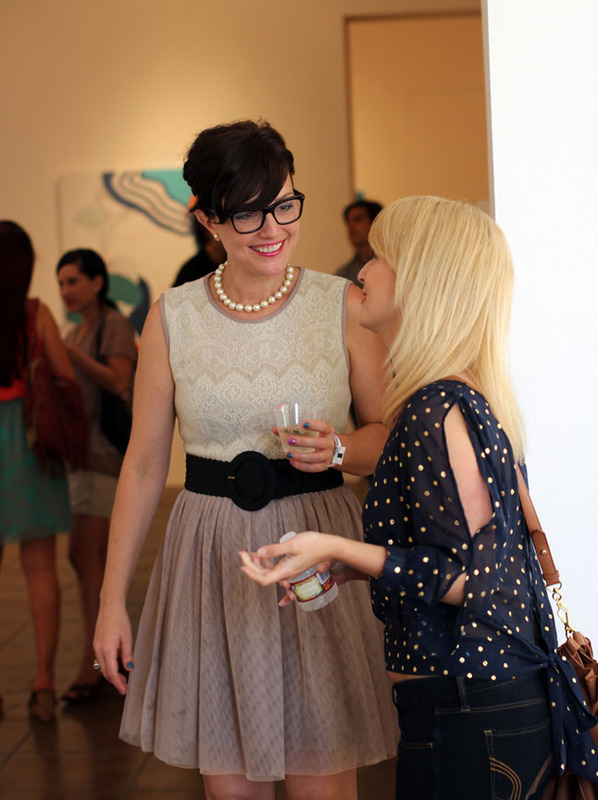 Q: Ann 330 has really embraced your work and did an amazing job curating the show. It seems like they really get your style and kept true to your vision. What was their take on how to set up the show? Caroline: They compared it to one of Nietzsche’s philosophies in the sense that it’s a progression of childhood into now. Then of course the title of the show Grow Till Tall Olifant is my interpretation of everything in life from when I was kid. They thought it was important to exhibit my paintings from 2006-2012, as well as some drawings from ages 9 through 11, some drawings from 2010 and recent drawings from my European travels. Although the majority of the pieces at my exhibition were created within the last two years, I did (create) a lot of organic shapes when I was young that you also see in the childhood drawings. From my first trip to New York in 1999 I became enamored with architecture and it wasn’t until a few years later (after many more New York trips) that all of my pieces became architecturally inspired. Everything became very straight edged, very horizontal and vertical, nothing in between . . . there were no organic shapes as there previously was in my work. Now I am getting back into creating more organic shapes with vertical and horizontal lines but they are looser for the most part. Q: So you are incorporating both of your styles as you mature as an artist? Caroline: Exactly. My work plays off fluidity and freeness of how I feel vs. a reflection of who I feel I am at that time. Q: Was that an intentional creative decision or did it just happen naturally? Caroline: In this body of work there are a lot of unintentional animal shapes; birds, ducks and elephants that I’ve been painting. So subconsciously, I’ve been creating all these animals. It’s purely instinct. When I was younger, I drew a lot and I would flip the drawing upside down and it would look like an animal or it would look like something else. That’s kind of a reoccurring theme from my childhood. So, in essence the whole title Grow Till Tall Olifant represents the idea of continuing to grow up, but never losing a certain part of your innocence when life was so simple. As I grow older, I value both the simplicity of life and the chaos. Throughout my work, whether it is a more chaotic piece or a minimal piece it represents my state of being at that moment and how I felt. Even the minimal pieces have little moments of chaos that come across in a more delicate manner than say the more chaotic pieces, and just the opposite, that the chaotic pieces even have moments of subtly. Q: Your work is consistent with bright and vibrant colors , and is there a difference in your style from installation, paintings or drawings? Caroline: My palette is always changing but has always been vibrant. The solo exhibition includes 19 paintings, drawings and a sculpture/installation. If you were to separate all of the pieces into their own series, my palette with each series becomes more apparent. When I teeter between a drawing, a painting, and an installation my aesthetic always wrestles back and forth between chaos and simplicity, constraint and looseness…as it has throughout the years. Q: What inspired you to incorporate the use of fabric as a medium in your multi-media work? It’s very interesting. Caroline: I first started getting into using fabric in a couple of paintings in 2001 and 2002, and then it was dispersed a bit over the next few years but I stopped again for a few years. In 2003 I began painting on t-shirts and then I also started hand sewing with embroidery thread on the t-shirts. I wore some of the t-shirts, I gave some to friends, and then from there I started to sell them in Miami and Los Angeles. I’ve always been inspired by grabbing materials that I already have and thinking of how to reinvent them which is also how I came up with my hosiery line collaboration with We Love Colors in the fall of 2009. Being interested in fashion and fabrics go hand in hand for me. It’s a combination of ADD where you want to play with different mediums but then it’s also that I believe every successful artist uses various facets; paintings, drawings, create installations and sculptures, and mixing all of these various things. And every time I draw, paint or work with other mediums, one thing will inspire me to create the next thing. It keeps my work evolving. I think that once you get three-dimensional it brings your drawings and paintings to life. Q: Do you have a favorite medium? Is there one that you gravitate towards? Caroline: I would say painting and drawing. But that’s because I’ve been doing that since I was 7 although I do have to say that creating installations is quickly becoming another favorite. Miami, Art Basel Miami Beach and being a self taught artist. Q: Can you tell me about your career in Miami? Your relationship to Art Basel Miami Beach, We Love Colors, and even your djing is consistent with the themes in your art. Its broad background while keeping consistent to your essence. Caroline: I think because I am a self-taught artist and didn’t go to art school, it’s a little different…some gallerists and art enthusiasts treat you differently than if you had gone to art school. My early knowledge comes from growing up around my father who’s an art collector and going with him to museums, galleries and auctions, and then taking advanced portfolio classes in high school and taking a couple classes throughout college. My father owned a gallery in Antwerp before we moved to Florida, and when he decided to move us he started his land development company in Orlando. He always pushed me into the business direction because he knew how hard it is to make it as an artist, and that’s why I went to college for business and received my degree in marketing and real estate. I have been using my business background to market my work. Being a self taught artist in Miami and not a part of the art schools they’re known for or any big art school on the east coast for that matter, I felt there wasn’t a huge reaction to my work. Music has always been a huge part of my life and I’m always listening to music while I work, and lyrics are always imprinted in my mind thus inspiring my work. I wrote for a great independent music blog in Miami, ‘Off the Radar’ for a little over a year and in the meantime was djing at a few local places in Miami. Q: I think a lot of those schools were tailoring their students to get swooped up by galleries and collectors right after graduation. Which isn’t a bad thing. It just is. Caroline: I think another disadvantage was not being South American since a lot of the work that was exhibiting was abstract like my work is but they were all South American artists getting represented by South American galleries. I was kind of feeling like an outsider in the Miami art scene, even though I had my thing going… I never really felt a part of it. Out here, I feel a lot more accepted. Q: You have your own solo show and next you are creating the installation for “The Box” at The Standard in Hollywood, which is a really big deal. And you’ve only been here for a year! Caroline: Both of those opportunities came within one month of each other. 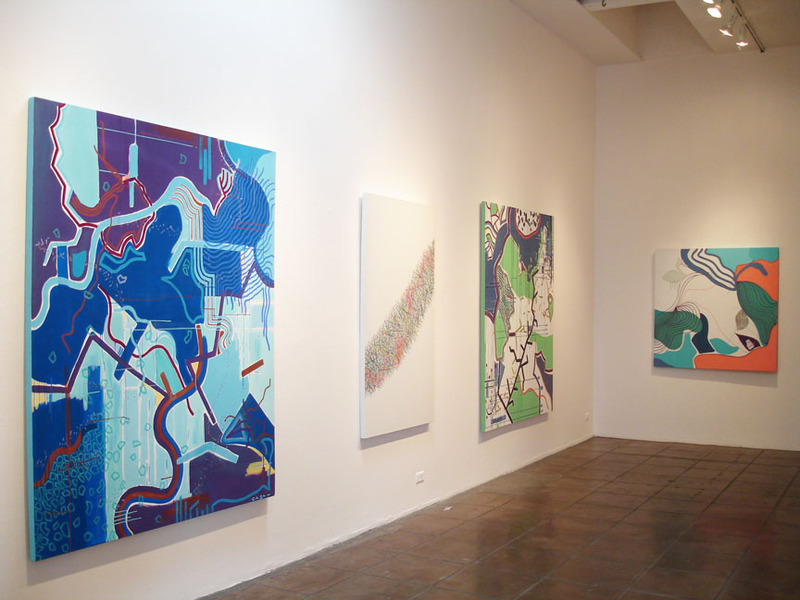 The solo show I got in December, so 6 months after I moved to LA. And that was through research and seeing which galleries I felt I fit into and then pitching to them. Q: So essentially you are were managing yourself? Caroline: Pretty much. I pitched to three or four galleries but I also was part of a big group show last December benefitting 826LA at the Marc Moore Gallery in Culver City. Q: Before we move on to other topics do you want to say anything else about the show that’s on right now? Caroline: Everything that was in my loft is now in the gallery. My loft feels empty without all of the work in here but in the midst of working on the installation for The Standard, my space is now filled with materials and pieces making it feel less empty. Being surrounded by my work while creating is part of my inspiration. Note: Caroline lives and works in a 1200 sq. ft. loft in Downtown Los Angeles. Her walls are usually covered in artwork. Today they are bare. Europe to The Standard Hollywood: An influential trip of a lifetime that contributed to creating an installation in one of LA’s hot spots. Q: Lets talk a little about where you are originally from. Caroline: Born in Belgium. Right outside of Antwerp. Q: Has it influenced your work at all? A lot of artists create based on emotion and it seems like Europe would lend a different vibe to day-to-day life. Caroline: I just came back from spending three months in Europe. It’s definitely eye opening to see how my environment shapes my work. It’s crazy because what the sun is to LA the rain is to Belgium. Florida also rains a lot more than here but its mostly sunshine. I’m pretty sure that my palette would be different if I grew up in Belgium. Growing up in Florida and now living in LA, the vibrancy of the city and all the sun has a definite and obvious effect on how I feel which then reflects my palette. When I was in Belgium and I went to go pick out fabrics for my sculpture, they were all very subdued colors and that’s because it was always raining and cloudy and my reaction to the change from here. Caroline’s installation at The Box at The Standard, Hollywood narrates her recent European travels, keeping vivid memories of home on her conscious. While traveling she found great inspiration collecting a breadth of materials: 1954 French topographical maps, Belgian, Parisian, Grecian, and Italian public transportation tickets. Each piece signifying different moments endured throughout the last several months. Q: So tell me about The Box at The Standard in Hollywood and how your recent travels to Europe inspired such a personal installation. Caroline: I’m installing in the first few days of August. The reception will be on the 16th and it will be up for the entire month of August. It’s an extension of Grow Till Tall Olifant and it’s also entitled Grow Till Tall Olifant. I first started thinking about what I was going to do for the solo show as far as an installation piece was concerned about 6 months ago. I really wanted to use materials that I already had in some way. A lot of the maps I had from Belgium I had from last year’s trip and I started cutting them up and started putting plexi scraps on them. I really didn’t know what I was doing at first. And as the work progressed, I made the connection with the big piece Grow Till Tall having a tree like shape in it, then it just kind of came to me one night to create a tree. Keeping with the theme of how the whole show relates back to my roots. It was crazy that my trip to Belgium was before these shows enabling me to collect more materials for the installation. I went to Paris in March and I found some really interesting maps that were in a set of two books from 1954 . . . topographical maps of France and those are incorporated a lot into the sculpture and the installation. Then I went to Greece and I collected more maps and those began to be incorporated as well as my trip to Prague. In addition, I used all the public transportation tickets that I acquired in Belgium, Paris, Greece and in Prague. Train tickets, bus tickets, and metro tickets were included into these pieces as well. So when I finally got back to Belgium I started making the leaves. The tree signifies my roots because of Belgium, but it also signifies all my travels and journeys. Q: This concept is so interesting and profound and all ties back around to your initial show. How did you choose which maps, tickets and fabrics to use? Caroline: As far as the Belgium maps go I really wanted to get a lot of the cities that meant something to me. Whether I had been there or my family was from there, I collected maps over the course of my trip. I met some girls from Paris through my best friend and two of them were from Belgium and one of them grew up where my mom grew up so that piece was used. She circled where her house was and I stitched lines around her circle, and they also gave me more tickets they had used. One of the girls was Italian so she gave me train tickets that she had from Italy as well as London. I like the idea that the maps and public transportation tickets were a big part of my journey and the people I encountered in the last several months and could be used as recyclable material. When you look at the fabric colors that I bought over there the colors are very subdued but the drawings are very vibrant and again that was inspired about how I felt over there. So the other day when I went to go buy the fabric for The Standard, they are all bright and I think regardless if its winter or summer in LA I’m always going to feel more vibrant here. And since the installation is at The Standard during the summer THE BOX should be something vibrant as well. I’m also going to incorporate fabric trim and cord to make the tree; some of it will be painted. All the leaves are going to be coming off the rafters as if they are an extension of the tree from the wall. It’s going to be very playful. That’s a word that people use to describe my work a lot. Q: You are also part of the sketchbook project that’s now touring around the country? Caroline: The Sketchbook project started in 2009 and I submitted the second or third month that it began. Its a big project that started in Brooklyn and they wanted to give the artist a community where every artist on any level can submit a sketchbook where they have different themes. I have submitted three so far. They are currently on the tour and they are showing in different gallery spaces throughout America. I also submitted for one that they pick one page from artist’s sketchbooks to create a coffee table book. And I think that’s coming out by the end of the year. Q: You have developed a little artist community of your own with your “La Femme Arts and Crafts Fiesta.” They pop throughout the year at your loft. Why did you start it and how would you describe it? Caroline: The first one we did was October of last year. La Femme Arts and Crafts Fiesta gives me a chance to host a creative day, have women over (some are creative types and some are not creative types) and it gives us the opportunity to create all together in my studio space, let loose and have fun. Q: And to meet other like minded women? Caroline: It spawns a lot of friendships and I think too it’s creating something I’ve never had before, because I never went to art school. I’ve only had a couple of collaborations with artists in Miami and I’ve always missed the relationships that you can have with lots of other artists whether it’s women that are artists or not, it gives us the opportunity to be creative in an intimate studio setting. I have always enjoyed your work since I met you in Miami during Basel and we included you in the Miami’s Independent Thinkers Art Fair 2009. Happy to see the growth of your vision. See you in LA soon.